What Do Politicians Know about Tech? 2014 saw IDG Connect start the Politicians Talk Tech series; where we quiz various political types about how they use and view tech. We’ve talked to MPs from all three major parties in the UK; Tim Farron from the Lib Dems, Chi Onwurah for Labour and Adam Afriyie from the Conservative Party. But that’s not all; we spoke to the leader of the UK Pirate Party, Sweden’s Bitcoin-only politician, as well as representatives from the US and Ireland. They think governments could and should be doing more to embrace technology, cautious about e-Voting, not a big fan of what the NSA and GHCQ have been up to, most likely using a BlackBerry or iPhone, have a 50/50 chance of knowing how to code, have an awareness of Bitcoins (possibly even use them in some capacity) and like social media. 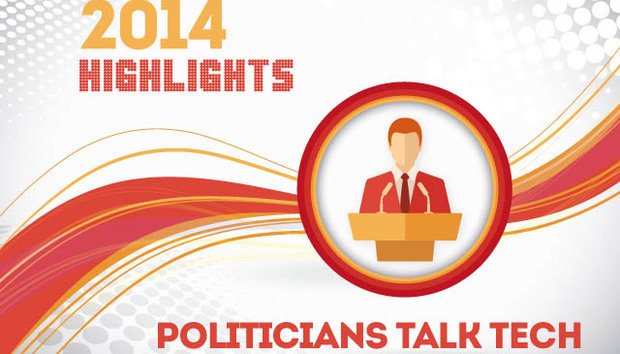 We also published some nice Infoshots on different aspects of politics & tech. We looked at the huge amounts tech companies spend lobbying in the US, as well as how much lower those numbers are for lobbying the EU. We also explored how engaged political representatives are with Twitter.